The Stream Habitat Viewer was created to enhance statewide stream restoration and conservation efforts. The Viewer provides a starting point for towns, private landowners and others to learn more about stream habitats across the state. 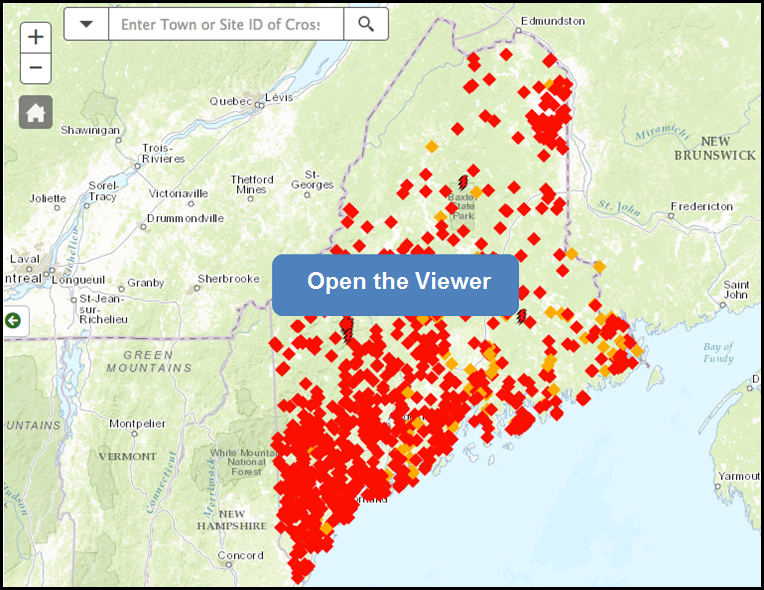 The Stream Habitat Viewer helps bring people together to restore and conserve Maine’s natural heritage while looking for opportunities to ease the financial burdens of road and dam owners. The Viewer displays habitats for several stream-dependent species important to Maine’s economy, ecology and way of life. It also provides locations and information about dams and road crossings, which can act as barriers to the movements of fish and wildlife and the stream processes that create and maintain habitat. Use the Contacts list to learn more about the habitats in your area, funding sources for projects and Stream Smart crossings. 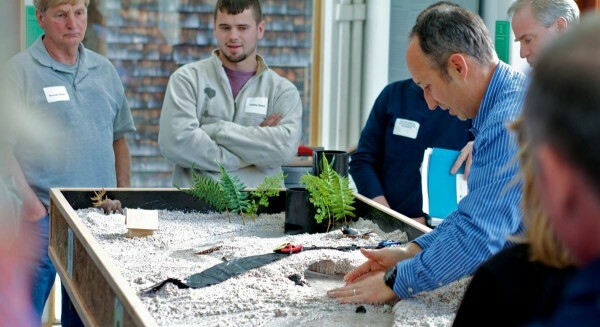 Convened by the State of Maine Coastal Program, the Maine Stream Connectivity Work Group is a partnership of state, federal, industry and non-government organizations working to improve Maine’s stream restoration efforts. See our list of Partners. Type your town name or a site identification number into the location box at the top of the Viewer map and select “Enter” or the magnifying glass. Click directly on crossings or dams on the map to get more information about them. If they are Barriers (red) or Potential Barriers (orange) there may be opportunities for technical assistance and funding to help improve these structures for fish passage and storm flow. Interested in talking to an expert for project planning advice? Select the “Contacts” link in the Welcome Tab for help with more information and project planning. Select the "Layers" tab on the upper left of the Viewer screen to see what kinds of habitats and crossings you can select. If the font in the layer name is gray, you need to zoom-in more before you can select it. To show the contents of a layer group, like “Crossings and Barriers”, select the folder icon next to the group name. Then select to “check” the box next to the layer. To show the legend for each layer, select the blue arrow next to the layer name. Select "Priority Habitats" from the Layer List. Select the layers you want to view. Look at the pattern of habitats displaying up and downstream of a given crossing or dam. Learn about individual features by clicking directly on them in the Viewer map. Information about the habitat, crossing or barrier will display as a moveable pop-up box as well as a report in the “Identify” tab. Topic experts can also be found in the Contacts section. If crossings haven’t been surveyed in your area, select the Training link to learn about arranging a survey. Select the Basemaps button on the map to view backgrounds like topographic maps and aerial photography. Displaying too many layers at once can clutter the screen. Use the “Adv Search” tab to learn more about layers in a particular area. You can search features like crossings, barriers and habitats by geographical areas like towns, watersheds or shapes that you draw on the map. For alewife, Eastern brook trout, and tidal marsh layers, you can also search by habitat size. In “Adv Search”, use the instructions in the “By Attribute” and “By Shape” subtabs. Your searches provide a report at the bottom of the map. You can sort the data by clicking on the report headers. Clicking a feature on the map that’s highlighted by your search will then highlight that feature’s corresponding row in the report. Clicking a row in the report will highlight the row’s corresponding feature in the map. Save the report data by selecting the “Export” button. The Viewer is meant to start the conversation about how to cooperatively assist the needs of habitats, road and dam owners and anyone else interested in Maine’s streams. Like most datasets describing complex natural systems, the Viewer data are incomplete and may be inaccurate in some cases. That’s why we think the Viewer’s highest value is to provide a starting point for project discussions. Decision-making about where and when to direct resources for stream restoration, road crossing replacements or other projects requires thoughtful consideration of multiple factors, not all of which are provided by the Viewer. Interpreting information in the Viewer is best accomplished with the assistance of our topic experts who are listed in the Contacts section. The Viewer’s “Priority Habitat” layers don’t describe all of the important features of Maine’s streams. The lack of Priority Habitat displayed or reported for the area of your interest doesn't mean there are no habitat values in that area, but instead may reflect a lack of information. Tidal marshes are included among Priority Habitats because they provide habitat to many species and deliver many other services like storm wave attenuation, coastal flood control, pollutant filtering and carbon sequestration. The “Crossings and Barriers” layers provide information for a variety of surveyed stream crossing and barrier types associated with roads and dams, which can block or hinder the movements of native fish and wildlife and the materials those species depend on. Barriers can also block the expansion of invasive species, but re-establishing stream connectivity often supersedes concerns regarding the spread of invasives. Clicking on features like dams and surveyed road crossings provides information about the site and upstream habitat. For crossings that were inaccessible to survey crews, calculations of upstream habitat potentially affected were based on the assumption that the crossings were "potential barriers", because on average, 90% of crossings are barriers or potential barriers. Q: Nothing happens when I try to select a layer or try to turn it off by clicking on the box next to the layer name. A: Some layers have so many data points that displaying them while zoomed-out would cause the Viewer to load very slowly. These layer names will be in gray text and unable to display until you zoom-in enough. Q: I’m having trouble getting the Viewer map to display. Who do I contact for help? A: First, check that you have a good internet connection. Second, try opening the Viewer in a different web browser. If that doesn’t work, please email the Habitat Viewer Project Manager using the Viewer’s list of contacts. Please provide in the email the name and version number of your web browser. Q: None of the listed habitats in the Viewer display for the stream I’m trying to learn more about. Does that mean this stream is not important for fish or wildlife? A: Unless they are severely degraded, all streams support some fish and/or wildlife species and may also have other important functions. The Viewer provides information for only a handful of Maine’s stream species. Also, many streams have not been surveyed, so even the data for our featured species is likely incomplete. We encourage you to use the list of expert contacts to learn more about the habitat values in their area of interest. Q: When I click on a crossing for information, the report tells me there are more crossing barriers upstream or downstream than what I see on the map. Why? A: Privately owned crossings are counted along with public crossings when determining the total numbers of barriers upstream or downstream of a feature. However, private crossings are not displayed on the map unless the owner has given express permission for their crossing data to be displayed. The number of upstream and downstream barriers reported includes dams, natural barriers and impassable waterfalls. Also, in rivers or streams with tributaries, all mainstem dams will be included in the number of downstream barriers. For these reasons, there’s sometimes a mismatch between the number of barriers reported vs displayed upstream or downstream. Q: Clicking on my crossing of interest results in a pop-up box that reports three upstream barriers, but on the map I count only one upstream Barrier and two upstream Potential Barriers. A: The Habitat Viewer includes both Potential Barriers and Barriers when calculating the total number of “Upstream Barriers” or “Downstream Barriers” reported in the pop-up box. Most Potential Barriers are often undersized, so, like designated “Barriers”, Potential Barriers often should be replaced if the aim is to restore fish passage and stream health. 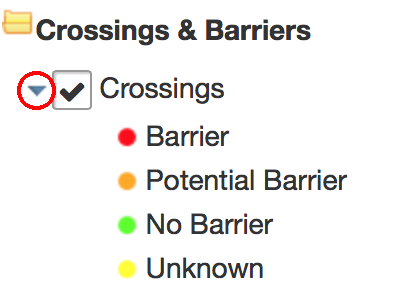 Q: Why doesn’t the Viewer display data for crossings where I know there are some? A: There may be several possible reasons. The first is that, with over 25,000 crossings in Maine, we haven't yet completed surveys of the entire state. Also, we don’t display data for private crossings unless granted permission by the landowner. And survey crews are not able to reach every site. Feel free to contact our training contacts if you would like to help with a survey. Q: I see crossings that don't seem to be on a mapped stream. Why is this? A: Sometimes the streams are so small they don't show up on the basemap you are using. Try using the Imagery or USA Topo basemap. There is also the possibility that the displayed crossing has the wrong coordinates, in which case, please inform the GIS and Database Manager. Q: What do you mean by "natural barriers", and why are there lots on some streams and none on others? A: Natural barriers include waterfalls, beaver dams and wood debris jams. These are all natural impediments to the movements of fish and other aquatic wildlife. At each natural barrier, we measure how much of a vertical drop there is and assign a severity category. Waterfalls differ based on their height, steepness and structural diversity. Some beaver dams can also block fish movement; others are more porous and allow various degrees of passage. Wood debris jams also differ in how they affect aquatic passage, with loose jams of trees and branches usually being very passable. We conducted surveys of all possible natural barriers on some streams, but it is very time consuming. For most streams we only surveyed natural barriers that were near a crossing or dam that we were already surveying. Q: My town is hoping to replace some crossings using Stream Smart road crossing design principles. Are Barriers are always a higher priority for replacement or funding sources than Potential Barriers? A: Not always. For instance, if maintenance costs and public safety are your primary concern, a severely undersized culvert that can’t adequately accommodate stream flows might be a top priority, even though it’s designated as a Potential Barrier versus a Barrier. We encourage you to use our contacts list to learn more about your area of interest and what options might best meet your needs. These layers provide information about surveyed stream crossings, dams and natural features that can act as barriers to the movements of native fish and wildlife between important aquatic habitats. Barriers also can block natural stream processes necessary to create and maintain habitat, like delivery of sediment, nutrients, organic material and also tidal flow. Barriers can also block the expansion of invasive species, but barrier removal to restore native fisheries and habitat most often takes precedence over concerns about the spread of invasive species. For sites with good restoration potential, voluntary funding and technical support programs may be available to help road and dam owners install Stream Smart road crossings and to remove unwanted dams or install fishways at dams lacking fish passage. Barrier: The crossing has physical factors that significantly restrict upstream passage of aquatic organisms and fishes, such as perching above the stream surface, as well as downstream movement of materials that create and maintain habitat. Potential Barrier: The barrier has physical factors that likely limit upstream passage of various aquatic organisms and downstream movement of materials that create and maintain habitat. The crossing shows signs of excessive current velocities, like scour. 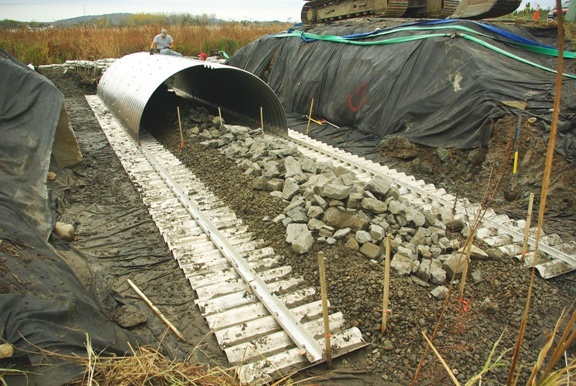 Excessive velocities can block fish and wildlife passage and are frequently caused or exacerbated by undersized culverts. No Barrier: neither of the above conditions was observed at the crossing. Unknown: survey crew could not access these sites. Barrier: the dam blocks most if not all passage of fish and wildlife and their access to habitat that supports key phases of their life cycle. Potential Barrier: the dam blocks some species while others may achieve passage during some flows where fishways have been installed or where the dam is partially breached. Fishways are designed for passage of a narrow range of species and often do not allow passage at all flows. Barrier: the feature blocks most if not all passage of fish and wildlife. Potential Barrier: the feature blocks some species while others may achieve passage. Data describing locations of waterfalls that block most if not all passage of fish and aquatic wildlife and where no records indicate passage was historically possible. Data were collected during field surveys or compiled by fisheries biologists of the Maine Department of Inland Fisheries and Wildlife and Maine Department of Marine Resources. This dataset is not complete, but represents the opinion of state biologists. Priority Habitats are habitat types that are the focus of many conservation and recovery efforts in Maine. These include habitats for endangered species (Atlantic salmon), species of concern (sea-run rainbow smelt) and other species that generate heightened recovery (alewife) or management (wild eastern brook trout) interest. Tidal marshes are included because they provide habitat to many species, buffer coastal communities from storm damage and play a role in carbon sequestration. The lack of High Interest Habitat displayed in an area of interest doesn’t mean there are no habitat values in that area, just that we’re unaware of them at this time. Contact information for species habitat experts is provided in the habitat layer descriptions below and also the Contacts section. Construction of the first dams on Maine’s large rivers rapidly resulted in declines of sea-run Atlantic salmon because much of their spawning and rearing habitat was blocked. Barriers caused by roads also block access to salmon habitat. Due to extremely low population levels, sea-run Atlantic salmon are a federally listed Endangered Species. This dataset provides Atlantic salmon spawning habitat locations from surveys conducted by field biologists within and outside of the Gulf of Maine Atlantic salmon Distinct Population Segment. The surveys were intended to document the presence of adequate habitat, not the presence of Atlantic salmon using the habitat. Categories in the legend are Limited Spawning and Spawning. This dataset provides Atlantic salmon rearing habitat locations from surveys conducted by field biologists within and outside of the Gulf of Maine Atlantic salmon Distinct Population Segment. The surveys were intended to document the presence of adequate habitat, not the presence of Atlantic salmon using the habitat. Class 1: Prediction that >50% of modeled reach is suitable habitat. Class 2: Prediction that 26-50% of modeled reach is suitable habitat. Class 3: Prediction that 10-26% of modeled reach is suitable habitat. This layer shows the HUC 10 watersheds that have been classified as Critical Habitat under the Endangered Species Act for the Gulf of Maine Atlantic salmon Distinct Population Segment. The National Marine Fisheries Service defines critical habitat as “the geographical area occupied by the species at the time of listing, if they contain physical or biological features essential to conservation, and those features may require special management considerations or protection; and outside the geographical area occupied by the species if the agency determines that the area itself is essential for conservation”. This layer depicts the boundary of the Gulf of Maine Atlantic salmon Distinct Population Segment (DPS) and the three recovery units (Penobscot, Merrymeeting, and Downeast) within the DPS. Alewife populations have declined dramatically over the past two centuries, most notably due to dam construction that blocked access to spawning ponds and lakes. Barriers caused by road crossings, many of which were installed in the past several decades, are also known to have blocked or impaired alewife habitat access. Alewife are a NOAA Species of Concern and were recently a Candidate for the Endangered Species Act. Accessible: the latest data indicate the run is active, with a self-sustaining population that is able to reach their spawning grounds without assistance. Accessible – DMR stocked: the latest data indicate the run is active, with a self-sustaining population that is supplemented by alewives stocked by DMR. These locations may not have been stocked in the most recent year, but have been stocked one or more years since 2010. Inaccessible – DMR Stocked: there is evidence that a run existed historically, but passage is currently blocked. The run is active only because of efforts to truck fish around the impediment or stock from a permitted source by DMR in one or more years since 2010. If the obstruction that presently blocks passage is removed a self-sustaining run is possible. Inaccessible - Not Stocked: there is evidence that a run existed historically, but no longer exists because of a passage obstruction, and if the obstruction that presently blocks passage is removed, a rejuvenated run is possible. Stream: shows the upstream and downstream passageways of alewife to and from their spawning locations and marine waters. Note: clicking the displayed stream or pond (spawning) habitat will provide status, harvest information, stream or pond name and pond acreage. All lakes and pond upstream of a harvest location will be listed as “Commercially Harvested” because the mainstem run is subject to harvest. In many of these cases, the harvest is located on a mainstem river. Accessible: no passage obstructions would prevent alewife passage to spawning lakes and ponds, but there is no conclusive evidence that a current run exists. Accessible – DMR Stocked: these are waters that have the capacity for alewife runs, but where a self-sustaining run has not been conclusively documented. These waters have been stocked by DMR in one or more years since 2010. Uncertain: for waters thought to have the capacity for alewife runs in the past, but where passage is presently obstructed or a self-sustaining run has not been conclusively documented. Sea-run rainbow smelt have experienced population declines and a contraction in their geographic range to the extent that they are now federally designated as a Species of Concern. Smelt streams across Maine are threatened by barriers that block access to spawning habitat, like undersized and/or perched road crossings. Other factors in smelt declines may include run-off and pollution caused by urbanization of watersheds. High: spawning was confirmed by the presence of adult smelt or smelt eggs in large numbers and multiple years during the 2005-2009 period, and some observations during 2012-2014, with no known decline from historical numbers. Limited: includes runs where either 1) spawning was confirmed by the presence of adult smelt or smelt eggs in one or more years 2005-2009, and some observations during 2012-2014, but not in great numbers or not in every year or 2) runs confirmed by the presence of adult smelt or smelt eggs in one or more years 2005-2009, and some observations during 2012-2014, but in numbers markedly reduced from historical numbers, based on DMR records or local knowledge. Declining: observations of these runs during spawning events in one or more years 2005-2014 found fewer smelt egg density or fewer adults than was observed in surveys performed in 1971. Uncertain: known spawning site in 1971 or modeled spawning site in 1984, but current status was not confirmed. Smelt access route: these lines are provided to draw attention to stream reaches and water bodies that are vital to smelt accessing upstream spawning habitat. Potential: not listed in 1971 DMR records and not modeled in 1984, but checked in one or more years 2005-2009, with no spawning activity observed. Historical: the site supported smelt spawning in surveys in 1971 and prior, but was no longer found to support spawning during 2005-2009 surveys, and some observations during 2012-2014. Smelt access route: draws attention to stream reaches and water bodies that are vital to smelt accessing upstream spawning habitat. Maine remains a stronghold for wild eastern brook trout. As a result, conservation of wild brook trout is a high priority for state and federal fish and wildlife authorities. Barriers like those caused by road crossings can hinder the movements of trout into habitats they require at different times of the year. This habitat layer represents all lakes and ponds designated by the Maine Department of Inland Fisheries & Wildlife and approved by the Maine Legislature as Maine Heritage Fish Waters. These waters contain Maine Heritage Fish, wild Eastern Brook Trout or Arctic Charr, that have never been stocked or have not been stocked for at least 25 years. This layer was derived from an updated Eastern Brook Trout Joint Venture model based on U.S. Geological Survey catchments. A catchment is the surface area contributing drainage directly to a given section of stream known as a “reach”. Catchments displayed in this layer are based on known occurrences through MDIFW survey efforts of wild eastern brook trout (WEBT) and assumptions about access, passability and distance. Areas where MDIFW actively manages for WEBT priorities are also included. Blank areas indicate that WEBT status is either unknown or is not a current MDIFW management priority. The tidal marsh dataset includes wetlands classified by the National Wetlands Inventory as Estuarine and Riverine Emergent Wetlands, which can range from saline to fresh. Individual wetlands may be mapped as multiple polygons or units representing differing conditions. The layer is incomplete in some cases, especially in large tidal systems like Merrymeeting Bay in the Kennebec River Estuary. Maine’s total tidal marsh acreage is relatively low compared to other northeastern coastal states, yet it provides necessary habitat for a wide range of fish and wildlife species and delivers other important services to people, like buffering coastal areas from tidal storm damage. Where tidal wetlands and non-tidal wetlands are separated by road crossings or dams, the upstream wetland is often impacted by the crossing and worthy of investigating for restoration potential. Tidal marshes on the map are often comprised of multiple mapped parts or “polygons” representing differing wetland conditions. So clicking on only one portion of the wetland might only provide information associated with that particular portion of the wetland. This layer provides known and assumed locations of non-native fish species. Non-native fish species, sometimes called "invasive", can outcompete native species that are highly valued in Maine. Non-native species include black crappie, largemouth bass, smallmouth bass, muskellunge, northern pike, and walleye. Barriers like dams and road crossings can block the spread of non-native fish, so barrier removals should be considered in light of adjacent non-native species concerns. However, concerns about the spread of invasives are often subordinate to restoration goals. Legend categories are "Documented" and "Potential". Waterfowl (ducks, geese, swans) and wading birds (herons, egrets, bitterns, ibises, coots, moorhens and rails) require certain types of tidal wetland habitat for feeding, roosting, nesting and brood rearing. Both high and moderate value Tidal Waterfowl and Wading Bird Habitat are defined as Significant Wildlife Habitat under Maine's Natural Resources Protection Act. Maine Department of Inland Fisheries and Wildlife has identified and rated intertidal areas along the coast as high or moderate value to waterfowl and wading birds. Tidal waterfowl and wading bird habitat includes only the mapped habitat within the coastal wetland, which is already regulated as a protected natural resource under the NRPA. This layer represents high and moderate value Inland Waterfowl and Wading Bird Habitat, both defined as Significant Wildlife Habitat defined under Maine's Natural Resources Protection Act. Maine Department of Inland Fisheries and Wildlife has identified significant inland habitats for ducks, geese, herons, and associated species of waterfowl and wading birds throughout the state, rating them as having high to moderate value. A high to moderate value inland bird habitat is a complex of freshwater wetland and open water areas plus a 250-foot wide area surrounding the complex itself where some species nest. On “great ponds” (over 10 acres), only the upland area that is within 250 feet of the freshwater wetland is included as part of this bird habitat. Beginning with Habitat Focus Areas are natural areas of statewide ecological significance that contain unusually rich concentrations of at-risk species and habitats. These areas are identified by biologists from the Maine Natural Areas Program, Maine Department of Inland Fisheries and Wildlife, Maine Department of Marine Resources, U.S. Fish and Wildlife Service, The Nature Conservancy, Maine Audubon and Maine Coast Heritage Trust. Focus Areas support rare plants, animals, and natural communities; high quality common natural communities; Significant Wildlife Habitats; and their intersections with large blocks of undeveloped habitat. Beginning with Habitat Focus Area boundaries are drawn based on the species and natural communities that occur within them and the supporting landscape conditions that contribute to the long-term viability of the species, habitats and community types. River herring congregate at a perched culvert during upstream migration. Dams and poorly designed road crossings in Maine can block fish and wildlife access between important habitats for reproduction, nurseries and feeding as well as seasonal refuges from extremely cold or hot weather. The distance between habitats necessary for the survival of individual species can range from a few hundred feet for turtles and amphibians to thousands of miles for alewife, blueback herring American shad, Atlantic salmon and other species that return each year from the open ocean to Maine’s freshwater systems to spawn. Barriers like dams and road crossings can also limit the mixing of populations, which can limit genetic diversity and hinder a population or species’ ability to adapt to shifting environmental conditions. Creating impounded, lake-like environments upstream of dams and roads. These impoundments can favor shifts toward invasive species that are able to outcompete native species like Eastern brook trout and Atlantic salmon. Increasing water temperatures in upstream impounded areas, which can lead to stress or death of native cold-water species like brook trout and salmon. Blocking sediment movement and altering downstream stream channels, which limits amounts of habitat available for reproduction, nurseries and other critical life stages of stream-dependent fish and wildlife. Restricting tidal flow in coastal marshes, which decreases the wetland acreage flooded by the tides. Less tidal flow favors the replacement of native plants by invasive plants that aren’t good habitat for native fish and wildlife. Records indicate the presence of over 1,000 dams in Maine, which does not include many small dams that were never registered with the state, like log drive structures that are long forgotten but continue to act as barriers to connectivity. Most of Maine’s dams don’t serve their original purpose and relatively few (179) are used to generate hydroelectric power. There’s also growing awareness that many of our road crossings hinder stream connectivity. 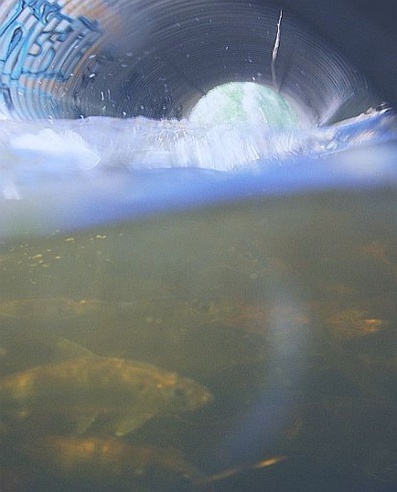 Since 2007, surveys at over 8,600 culvert crossings revealed that about 42% of these structures are physical barriers to the movements of at least the weakest-swimming fish, which include early life-stages of trout and salmon (data processed as of April 2016). At most of these crossings, the culvert bottom was elevated above the stream surface or "perched", which requires a swimming or leaping ability that not all fish or wildlife have. 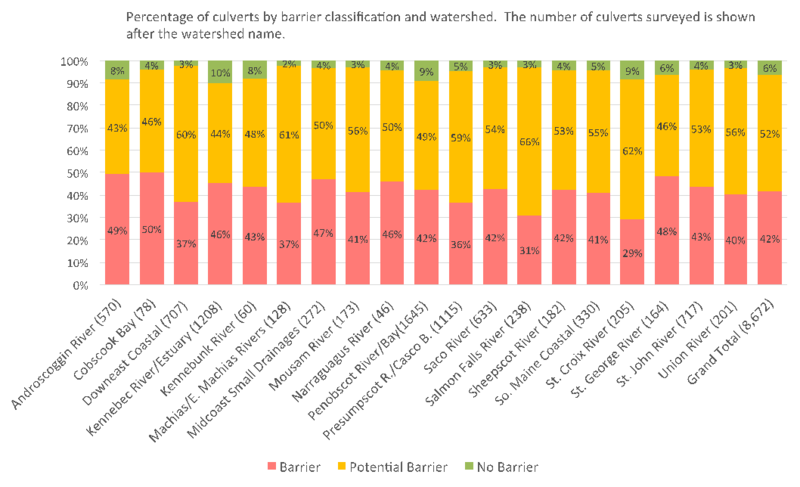 An additional 52% of culverts were classified as "potential barriers". These structures were not perched or blocked, but many showed signs of excessive water velocities within the culvert, which likely resulted from undersized culvert diameters that "pinch" the stream channel. Like water flowing through a progressively smaller hose, stream velocities increase when they flow through undersized crossings. Even if a fish can leap or swim up into a moderately perched culvert, it may not have the strength and endurance to pass through it if the width of the structure is undersized. Undersized bridges can also “pinch” the stream width and are known to cause velocity barriers. What are the Habitat Impacts? Dams can block fish access to all upstream habitats and also downstream habitats under certain flow conditions. Consequently, dams have an especially dramatic impact on species like salmon and river herring that require access to the marine environment and also freshwater areas far inland. A recent study in Maine reported that by the mid-1800s, dams in Maine reduced available alewife spawning habitat (mostly ponds and lakes) to less than 5 percent of the pre-colonial amount (Hall et al. 2010). In terms of landscape-wide impacts, culverts that are barriers and potential barriers number in the thousands. Surveys completed in the lower Kennebec and Penobscot Watersheds estimated that culverts hindered or blocked fish passage and native stream processes in over 35% of perennial stream miles. Recognition is growing that fish and wildlife conservation, impaired stream connectivity and stewardship of aging infrastructure (dams, roads, etc.) are deeply entwined topics. At each dam or road crossing that constitutes a barrier, there can be considerable overlap between the interests and goals of those who own the structure and those charged with the recovery and conservation of stream dependent species. Owners of aging, unwanted dams and undersized road crossings shoulder a burden of public safety and financial liability. In some cases, these owners can benefit from voluntary programs that put them in touch with limited funding and technical assistance resources. Learn more about these opportunities. Another recent advance is the development of a "Stream Smart" approach for designing and constructing road crossings in Maine. With assistance and expertise of numerous state and federal agencies, industry and NGOs, Maine Audubon has developed a brief set of voluntary principals that provide road owners with a highly flexible approach for replacing aging road crossings with ones that promote stream connectivity. By allowing more natural flows, the Stream Smart approach also promotes road crossings that accommodate storm flows better so they can reduce maintenance costs and risk of harm to the public. Set the crossing structure so that the natural, pre-disturbance streambed elevation is re-established or maintained. Size the span of the crossing to avoid pinching the stream channel and preferably, exceed the natural channel width. Tidal crossings will often require more span width than non-tidal crossings. Maintain natural slope and alignment of the stream channel. Ensure that natural substrate is maintained inside the crossing. Hall, C. J., A. Jordaan and M. G. Frisk. 2010. The historic influence of dams on diadromous fish habitat with a focus on river herring and hydrologic longitudinal connectivity. Landscape Ecology 26:95-107. Moore, S. 2013. Maine Stream Connectivity Work Group 2012-2013 Report. Prepared for the Maine Coastal Program, Department of Agriculture, Conservation and Forestry [since moved to the Department of Marine Resources]. Wippelhauser, G. 2008. A report on fish passage plans and standards, by Maine DMR and DEP, Jan. 30, 2008, to the Joint Standing Committee on Marine Resources and the Joint Standing Committee on Natural Resources, in response to Resolve Chapter 109 (LD 1528, LR 1911). Maine Department of Marine Resources, Hallowell, Maine. 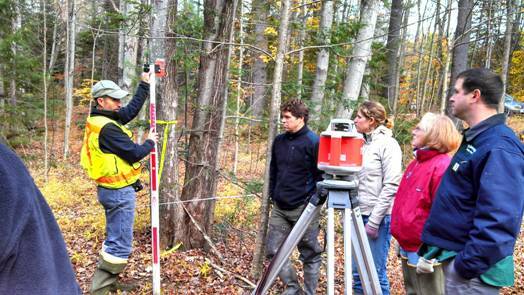 In 2011, Maine Audubon and partners launched Stream Smart, a program that trains contractors, landowners and other professionals responsible for road-stream crossings, how to construct crossings that maintain fish and wildlife habitat while protecting roads and public safety. Since its start, the program has hosted workshops and fields trainings for over 850 people across the state and reconnected hundreds of miles of stream habitat for wildlife. Stream Smart road crossings let the stream act like a stream and make the road invisible to the stream. Visit the Stream Smart website to learn how to design and build a Stream Smart road crossing and how to access guidance documents, resources, videos and contact information. The following organizations are members of the Maine Stream Connectivity Work Group. Those with asterisks generously provided expertise and advice important to the development of the Maine Stream Habitat Viewer.